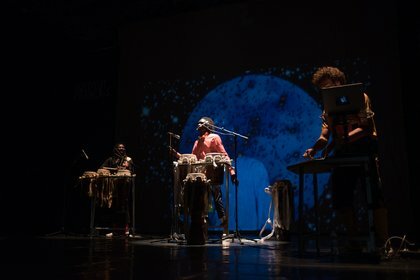 Electro-Sabar is what Guiss Guiss Bou Bess call their dynamic audio-visual amalgamation of electronic music with traditional Sabar percussion and Mbalax.The ensemble grew from an encounter between Senegalese singer, dancer and drummer Mor Talla Seck and French electronic musician, percussionist Stéphane Costantini in 2016. They joined with video artist Benjamin Richard to produce their first video, 'Jigueenu Africa', featuring scenes of Dakar street dances. Richard's scenes of Senegal life feature in the live show alongside clips of Mor Talla Seck's father, the late Alla Seck, renowned dancer and lyricist in Youssou N'Dour's original 'Etoiles de Dakar'. The band says their mission is to spread the living cultural legacy of Mbalax to a broader public. 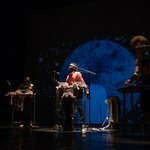 Their trance-inducing mix of pulsing electronic constructions turbo-charged with multi-layered Sabar rhythms seems like an excellent way of achieving it.